Dan, Eric and I skied a couloir to the climber's left of the Distal Phalanx a few weeks ago. Awesome read; heal up for the spring/summer season! Holy crap -- hell of a day Ryan. Sorry to hear about your arm, though it sounds like maybe it saved your knee? Heal up quick. Hope your arm is doing well. great write-up! and what an amazing line! Hope the surgery goes smoothly and you recover quickly. Excellent photos.. line and writing. Not a bad way to be knocked off the horse. great writeup - those b&w images with blurry skiiers are spooky! Way to get it guys! Looks yummy. Hope you heal quick Ryan! Exquisite piece of work gentleman. Dave and I missed you Ryan on the Duffy. Always bring your passport to Bham!! Looking forward to having you back again this summer. Amazing in every way! Thanks once again Ryan. Bummer about your arm. get strong quick. Wow, that is incredible! Nice injection of humor to go along with a stunning TR, too Ryan. Crazy beautiful! Get well soon. Just to be clear, you skied what Beckey calls the North Route on Mantis Peak, correct? That's the line that my brother Gordy first climbed in May 1982. 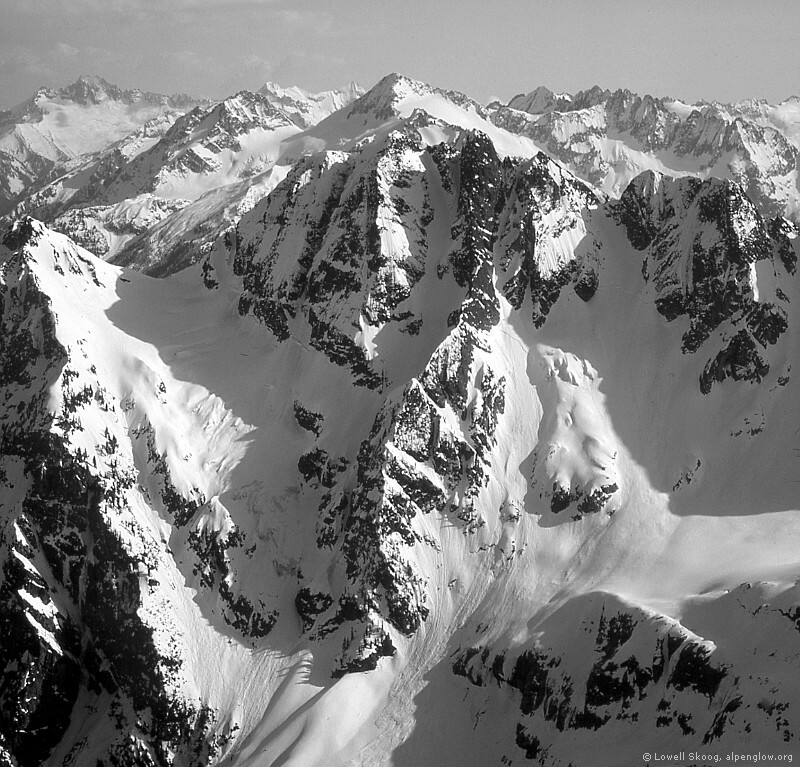 It's the couloir between Mantis and Distal Phalanx, somewhat left of where Eric is pointing in your picture. 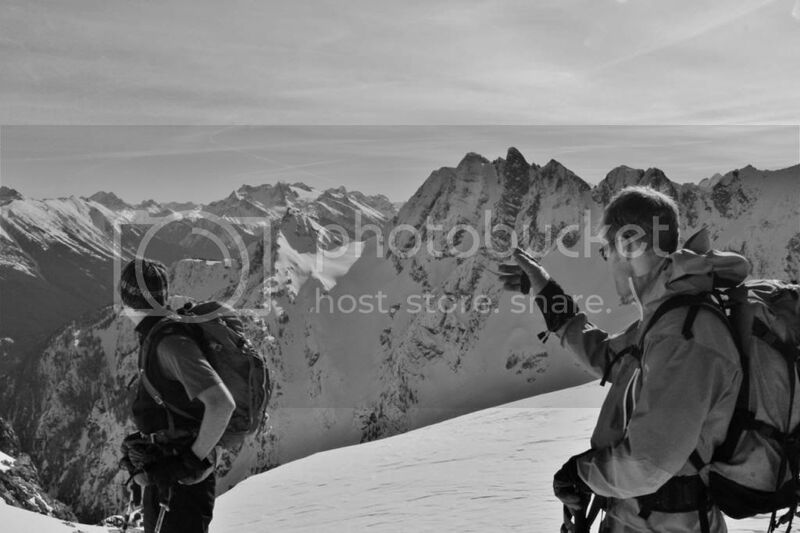 yep you got it Lowell, the couloir is just left of my glove, just looker's left of the rocky ridge/summit that is DP--it winds down from between 7614' Mantis and Distal Phalanx (Mantis's sub-peak immediately west).� � Mantis would be the logical top-out, but there was too much rock showing for us to imagine skiing the last bit from the top. oh btw, here's a link to more pics. Outstanding work and the embodiment of the ski mountaineering spirit. I know well that time frame of the go-no go, good choice. The "Mantis Peak North Route" is the obvious broad, curving gully in the center of the picture. I does look like there are other (narrower) gullies in the neighborhood. I'm not aware of any of them having been climbed or skied. It has a similar shape to Magic Mtn/Yawning Glacier! (Same general layout, with couloirs, cols, basins in the same places).